The Steppe eagle (Aquila nipalensis Hodgson, 1833), as the name suggests, is a bird of prey typical of the central regions of Asia, which immediately recall to mind the classical Russian, or anyways Asian, steppe, but, in reality, this environment is just one of the many frequented by this accipitrid, which shows a remarkable adaptability, conditioned almost only by the presence of suitable preys, even if it prefers open areas rather than those densely wooded. 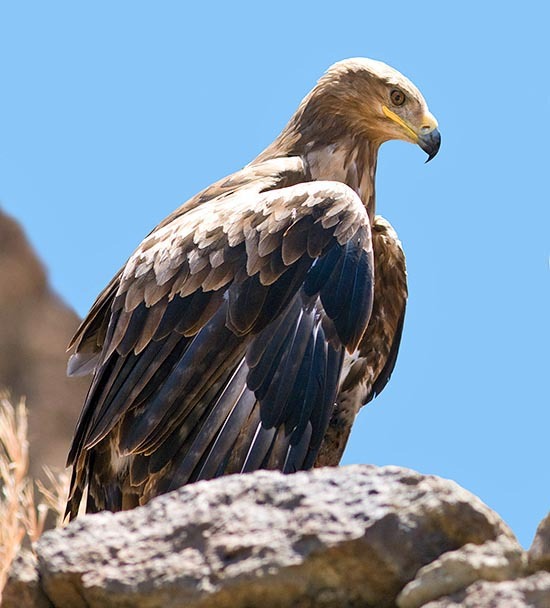 Also the scientific name “nipalensis” refers to an Asian country, the Nepal, where, indeed, this eagle is present, but its distribution area goes from Romania to Mongolia, including the basin of the Caspian Sea, the Caucasus and part of southern Russia. This is a bird belonging to the order of the Accipitriformes, family Accipitridae, genus Aquila, commonly found also in Africa, where the specimens living in the western zones of its distribution area migrate during the boreal winter, whilst those of the easternmost areas chose more frequently India as …winter holidays. Usually, the penetration corridor into the African continent is represented by the Arabian Peninsula, where part of migrants stops for spending the winter, whilst the remainder distributes widely in African, from the easternmost part of Egypt, to Sudan, to East Africa countries, but the arid Horn of Africa, and down to austral Africa: Zambia, Zimbabwe, Mozambique, Angola, Namibia (but the coastal desert belt), Botswana and the extreme north of South Africa (Limpopo). To be honest, however, we should make a clarification: some distinguish two subspecies of this bird: Aquila nipalensis orientalis and Aquila nipalensis nipalensis and, between them, the first should be the one more frequently choosing Africa as hibernating area. 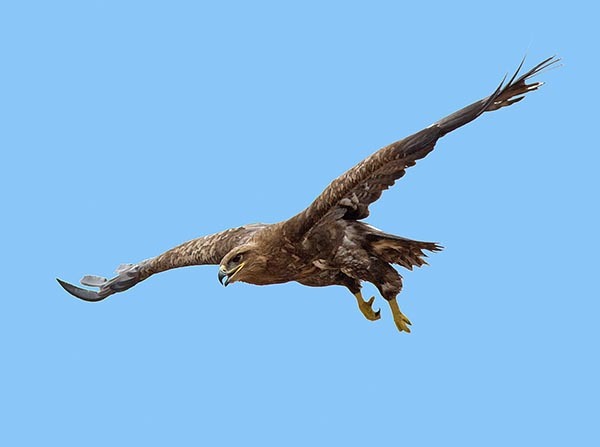 It is a great bird of prey, with a wingspan varying from 160 cm to more than two metres and from 60 to 80 cm long. The sexual dimorphism is almost absent, apart a slight difference in the dimensions, the female being bigger (up to 4 kg of weight against the 2200-3500 g of the male). The colour is dark brown, often with a paler spot on the nape. The young specimens exhibit a paler cinnamon colour. If we observe it while resting, the overall appearance is that of a rather massive bird, with long “trousers” and short and robust yellow claws, and the tip of the wings reaches the apex of the tail. The eye is dark, whilst that of the Aquila rapax, similar and quite frequent in Africa, tends more to the yellow, the “buccal rhyme” is long and likewise yellow is the zone of the nostrils, with dark apex of the beak. When flying, the wings are long and with a broad section, with quite evident and digitate remiges, of brown colour, while the young individual distinguishes due to a white belt running along the wing. The tail is relatively long and rounded, and the feathers show a series of transversal pale striae, whilst in the Aquila rapax they are of uniform colour and in the whole the animal is paler, tending to the reddish. Usual preys are rodents and mammals up to the size of a hare, but it hunts also birds, mainly when they are on the ground, as the hunting in flight is not the one it prefers, except, at times, during the reproductive period, on the contrary, it often goes hunting …walking, often driving out the preys from the bushes and then flying away shortly and finally plunging on them. Reptilians, batrachians and carrions, however, form part of its diet. Usually, it goes hunting alone, abut quite often they observe small concentration of eagles in places where there is a particular abundance of food, like, for instance, close to the termite mounds while a swarming is taking place, in occasion of locusts’ migrations, on the front of the fires which compel a great number of preys to move or in the proximities of a colony of Red-billed quelea (Quelea quelea). The queleas are African passeriforms and are probably the birds present in the greatest quantity on our planet; they move in flocks counting, at times, millions of individuals, so many that I remember having seen a big branch of acacia breaking under their weight and such flocks, observed while flying, are one of the strangest and most incredible events of Africa: a solid mass moving at crazy speed, changing continuously of shape, from that of a serpent to that of a balloon, with a miraculous timing. The female of the Aquila nipalensis lays from one to three eggs, which are hatched in a nest coarsely constructed with branches, mainly on the top of a plant. → To appreciate the biodiversity within the birds of prey and find other species, please click here.